We have had a nice supply of eggplant from the garden this year. We cook them in a variety of ways, but lately I have enjoyed stuffing them. There are recipes for stuffing eggplant with lamb, ground beef or sausage, rice, or bulgar. You can add nuts, tomatoes, peppers, cheese, olives, capers. The variations seem endless, but I keep my recipe fairly simple using breadcrumbs and cheese. Feel free to experiment, adding tomato sauce if you prefer. 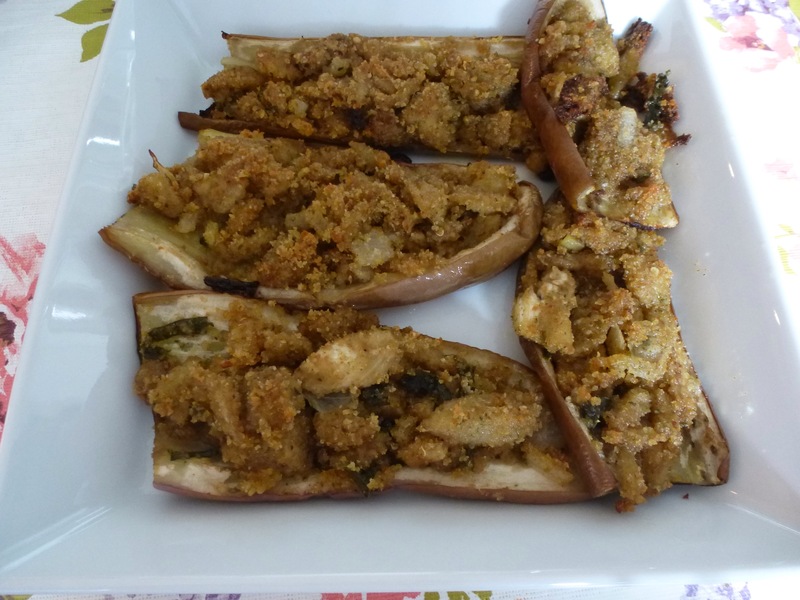 I use the Ichiban eggplant variety for this recipe because they are very sweet. Preheat oven to 400 degrees. Drizzle a bit of olive oil onto a half sheet pan so the eggplants will not stick. Rinse all of the eggplants, slice off stems then cut lengthwise in half. Spoon out the raw flesh from each eggplant half and place on a cutting board, leave enough flesh attached to the peel to create a shell. Lay the eight eggplant shells, cut side up onto the prepared baking sheet. Drizzle a little olive oil onto each eggplant shell and sprinkle with a bit of salt and pepper. Rough chop the spooned out eggplant flesh then place into a large bowl to make the stuffing mixture. In a frying pan heat 2 tablespoons of olive oil and add chopped onions and garlic. Cook 5-7 minutes, stirring occasionally to soften vegetables but not brown them. Pour cooked onion mixture into the bowl with raw chopped eggplant. Add breadcrumbs, cheese and basil to the eggplant mixture. Stir to mix. Add salt and pepper to taste. Stir in 1/2 cup extra virgin olive oil. Stuff each eggplant half with a heaping portion of the stuffing mixture. Cover the pan tightly with foil and bake for 30 minutes until the eggplants are soft when pierced with a fork. Remove foil and bake another 5-10 minutes to brown the stuffing mixture. Remove from the oven and serve. Serves 4-6. This entry was posted in Christmas, Thanksgiving, Vegetables, Vegetarian. Bookmark the permalink.